Last year, over 14.6 Gigawatts were installed in the United States, bringing the US installed capacity to over 42 GW, enough to power over 8 million homes. Happy Earth Day to all! This commercial solar installation has produced over 2.4 megawatts of electricity since it was turned on earlier this year. This is equivalent to planting over 4,000 trees and preventing the release of over 75 tons of carbon emissions into the atmosphere. The city of San Francisco is one of the foggiest cities in the country, yet the number of solar homes in the city is quite high. This is because solar is economically viable even when there are a lot of cloudy days. Solar cells produce more efficiently at cooler temperatures, and the diffusion of light inside the clouds causes much of that light to still reach the panels. California has experience record rainfall this year, which has slowed our installations from time to time. During a break in the clouds, our intrepid photographer captured this magical moment under the rainbow. 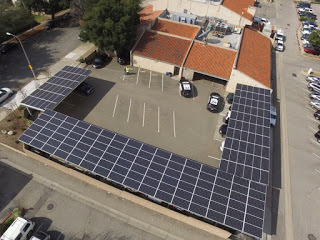 This 60 kW system will provide power for both buildings and shade for most of the parking spaces. Solar Carports are one of the best ways to provide the dual benefit of power plus shade from the hot California sun! Happy New Year everyone! 2016 was a great year for us, we completed over 3.4 megawatts of solar installations! We are hopeful 2017 will be a better year, for all of us.